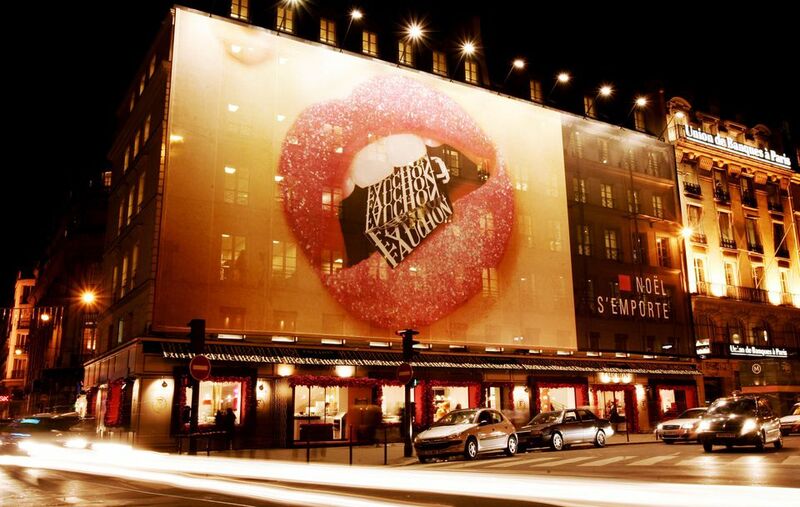 With its first store opened on the Place de la Madeleine in Paris in 1886-- the flagship shop still stands there today-- the Maison Fauchon is one of Paris's cream of the crop gourmet food shops. Peddling everything from gourmet grocery items such as chocolates, signature tea and coffee, biscuits, jams, conserves, mustards, confits, oils, foie gras and pâtés, this iconic Parisian épicerie also has a separate bakery and traiteur (gourmet delicatessen) at its Madeleine location. There's also a restaurant-tea house and a wine cellar. Fauchon is especially flooded during the Christmas and holiday season in Paris since it's a favorite place to stock up on holiday meal items and gifts for foodie types. Address: (flagship Paris shop:) 30 place de la Madeleine, 8th arrondissement (grocery shop); 24-26 place de la Madeleine (bakery, patisserie and gourmet delicatessen). For other locations and for online ordering, see this page. Fauchon products are also available in gourmet food aisles at several popular Paris department stores, including at Galeries Lafayette and Bon Marché. The gourmet grocery shop at #30 sells a wide range of delectable items produced by the brand, including chocolates and truffles, artisanal candy and confectionary, madeleines, macarons, and cakes, a range of black, green and herbal teas, sweet and savory biscuits and crackers, pates and foie gras, oils, herbs and spices, and other items. Most of these come in giftbox sets, so the shop is a perfect place to peruse if you're looking for something special to wrap. The grocery also includes the wine cellar, offering some fine French and international vintages. The bakery and patisserie at #24-26 peddles some of the capital's best breads, pastries and baked goods, including the Maison's famed eclairs-- past limited editions have featured silver-screen icons Marilyn Monroe or imitated famous paintings--, macarons, cakes, croissants or pains au chocolat. The "savory deli", also at #24-26, can be a great place to head for a delicious but fairly informal lunch, offering gourmet sandwiches, smoked meats and fish, and other traditional French "traiteur" items. There's also a charcuterie, cheese, and seafood section. This can be a great bet if you've rented an apartment equipped with kitchen in Paris and are looking to put together a fabulous but labor-free holiday meal while on your sojourn. The cafe-restaurant offers lunch, dinner, coffee and drinks. Do remember to reserve ahead, as it's a popular spot for unwinding post-shopping-spree: +33 (0) 70 39 38 39. Fauchon offers delivery and catering services in France, and ships dry and canned goods internationally. See this page to order online, and this page for catering services. Fauchon's holiday and Christmas window decorations are invariably beautiful and inspiring, featuring chocolate sculptures and foodstuffs for the holiday season. You might think about stopping there for a whirl after enjoying Christmas lights and holiday decorations at department stores nearby. For more ideas on where to find high-quality and exclusive food and wine items in Paris, read all about La Grande Epicerie Gourmet Market at the Bon Marche department store, or check out our guide to the best permanent market streets in Paris: areas like the Rue Cler and Rue Montorgueil, where vendors peddle delicious, high-grade fruit, vegetables, cheeses, meats, bread and pastries, and other items every day of the week. Finally, see my colorful photo tour of one of the city's most coveted gourmet open-air food markets, the Marché d'Aligre. From gorgeous purple artichokes and bright red cherries to mouth-watering bread and pastries, this market has all a food connoisseur could possibly dream of.